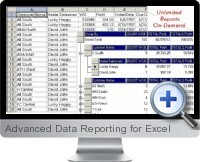 Advanced Data Reporting for Excel (Drill-Down Tally) is an advanced data report writer for any business. Just 3 easy steps: define groups, make calculations and enter details. This is the easiest way for a novice user to create powerful reports from Excel data, ACT! (Customer Management software) and CSV files. It creates reports faster than Crystal Reports. Advanced Data Reporting for Excel was created to help everyday and non-technical users create ad hoc reports quickly and easily without the need or help of your IT department. The process of creating a Advanced Data Reporting for Excel report is very easy. You choose column titles or filed descriptions and their associated Show As type from a selected data set or data worksheet. Advanced Data Reporting for Excel dynamically changes the report to reflect your desired output. You can dynamically change the report definition 1000's of different ways to get what you want quickly and easily. Group your totals for example by Team, Division, Salesman, Job Type, Year or even total dollar amounts. You can use the Record Set Filter to restrict the records reported on. Any field in the record set can be used to restrict your records. You can also use the Totals Filter to only get for example customers that have Profit margins above one million dollars. After you have the records you want, you can preview, print and save the new report. You can also design a 5 year cross tabular (equivalent to a Microsoft Excel pivot table) analysis of your most profitable products or customers. There are an unlimited number of reports you can design with ease at your fingertips without waiting for a programmer to do it. You're in control of your data giving you the competitive edge. Auto-Design. One of the best features of Advanced Data Reporting for Excel is that it allows any level of user to experiment very easily by quickly changing the field settings in the Report Definition tab. As you change these settings, you immediately see your results in the Drill-Down tab. This allows you to create an unlimited number of reports from one record set. New Report Wizard. One of the newest features of Advanced Data Reporting for Excel is that simply makes it easier to create a report. The wizard will help any novice create a new report in 3 easy steps. The wizard gracefully generates a new report in blinding speeds. No training needed with this added feature. Drill-Down Reporting. One of the best features of Advanced Data Reporting for Excel is that it automatically creates a report for first group in your drill-down. The first report contains information pertaining only to your first defined group level. The second report contains information pertaining to all group levels and their details. Group Calculation Groups. Another powerful feature of Advanced Data Reporting for Excel is that you can create a group from your aggregate group calculations. This is a powerful addition to the feature set. This means you can create drill-down report(s) containing information pertaining to several different revenue levels. You could put them in groups of excellent, so-so or poor based on the profit your company receives and drill-down on each of them. Gateway File Setup. Create reports from ACT!, .txt (comma separated), .csv (comma separated values) text files or Microsoft Excel data. You can design reports with exported data from Google, Amazon, eBay. You can gain direct access to Microsoft Excel data via the Sheet Name or Range Name of your favorite worksheet. Or any other text file you can export data from. You can create as many reports as you want from your downloaded, exported text or Microsoft Excel data files. This is a great productivity tool for all buyers and sellers who access the world wide web or want more detailed reporting from your Microsoft Excel data. Screenshot Demo. A demo was added to the help menu to help users get more familiar with the reporting capabilities of Drill-Down Tally. It includes a user controlled slide show creating a simple tabular report to designing an advanced 5 year trend analysis. Tally FlexMart. Creating a Tally FlexMart is an important part of Advanced Data Reporting for Excel. It allows you to wrap up a report definition and it's underlying data into a mini application. After you create the Tally FlexMart you can send the file to any other licensed owner of Advanced Data Reporting for Excel. They can now create as many reports as they want from the data you send them. Auto-Update. The software package allows you to update/upgrade the software package with minimal effort. Unpack updates to a central location and all other users can automatically pickup the necessary changes the next time they open Advanced Data Reporting for Excel. FREE Unlimited Live Help Online. Last but not least free unlimited online support. Get your questions answered online with our Live Help Online feature. You're up and running in a heartbeat with this added benefit. Look for menu option Live Help Online Now.